Professional boiling hot water weed control machines from Waterkracht. We have developed an environment-friendly and optimal method for controlling weeds on paved and semi-paved surfaces. This method is extremely effective, sustainable and offers excellent value for money. Since 31 March 2016, there has been a ban on professional users applying chemical weedkillers on paved surfaces. The aim of this measure is to improve water quality and protect human health. At present, the ban only applies to paved surfaces, but the plan is to extend this to unpaved surfaces in the near future. Waterkracht has found the best alternative to chemical weed control, which involves destroying weeds with its patented Boiling Hot water Technique®. By spraying weeds with clean Boiling Hot Water at exactly 99 °C, the cell structure of the plant is destroyed and it dies. The spraying occurs at low pressure (1.5 bar). 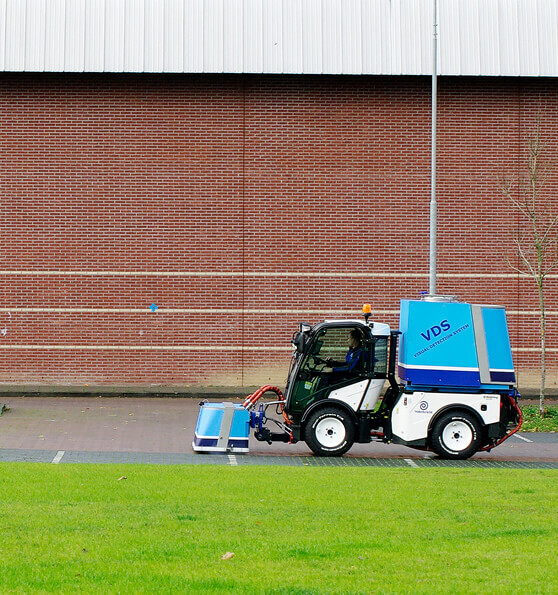 This makes Waterkracht's weed control machines suitable for all paved and semi-paved surfaces. An additional advantage is that there is no spattered dirt resulting from water at high pressure, and it is possible to work right up to the façade without soiling it. Water conducts heat much (about 25 times) better than steam or hot air. By only treating the surface about 3 to 4 times per season, you can achieve the most efficient result with the best value for money. Research has shown that the Boiling Hot water Technique® is the most effective alternative method for weed control. This method only requires 4 treatments per year, and produces top-class results.